We hope you are enjoying some great fall weather and maybe getting some golf in. It’s Ryder Cup weekend up here in Chicago and the buzz is palpable! Switching gears from the great outdoors to the great indoors let’s talk about what’s happening in the kitchen. We have gotten a lot of praise for our No-Pasta Vegetable Lasagna post from last week. A couple of the emails that we got asked about a “missing step” that many recipes call for which is the “salting of the eggplant to draw out bitterness”. What we have found is that particular step isn’t necessary if you buy “male” eggplants. To be clear, we completely understand that eggplants as fruit are “the products of reproduction and do not have a gender. Plants that produce fruit require the pollination of their flowers. This occurs when pollen from the flower’s male organs (stamen and anthers) comes in contact with the female organ (stigma) either by insect activity or wind. The pollen then travels down a tube below the stigma (style) and into the ovary, which eventually becomes the fruit. Eggplants are self-pollinators, meaning that they have both the male and female organs within the same flower. However, incomplete pollination may cause a fruit to develop fewer seeds, which kitchen lore might call “male.” (note the comment from one of our readers “Richard” who reminds us that there isn’t a gender for our lovely eggplant) Over-mature eggplant fruits that have lost their glossy purple color would have bigger, more noticeable, mature seeds which cause bitterness. However, many cooks believe that there is a connection between the “gender” of an eggplant and the number of seeds (and therefore bitterness) should choose their fruit based not only on its glossy purple skin and smaller size, but also on its purported gender. So how do we find these “male” eggplants? 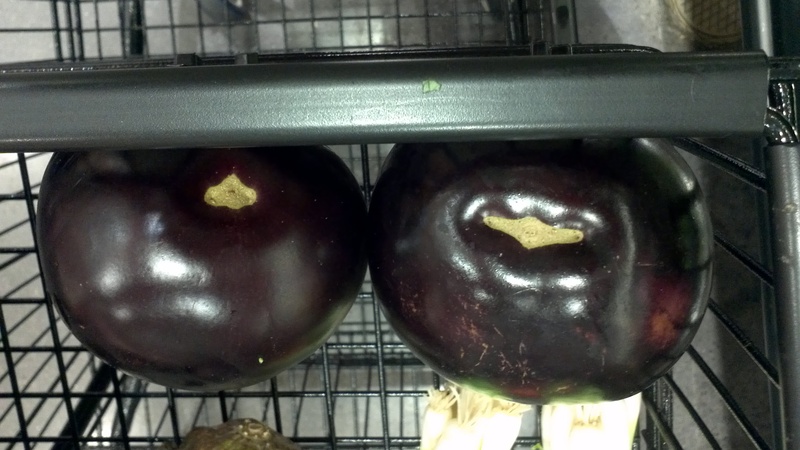 When looking at the bottom (blossom) of the eggplant, you will notice a difference in the shape of the indentation. The round indentation would represent the “male” (left) while the more linear indentation would signify the female (right). You want eggplants that are smaller, bigger is not better in this case! Avoid those that are extremely large, dried out (dimpled) and have a matte finish to them. Thank you for the comment and details on the reproduction of eggplants. Although we recognize the eggplant as fruit in the post along with some of the details on reproduction we definitely call out the “sexing of an eggplant”. We appreciate the insight and will modify the post accordingly. Have a super day!